A cycling blog for Hagens Berman - Society Consulting Cycling Team. Helping racers develop and win in the Seattle area. The Hagens Berman / Society Consulting team would also like to extend a special thank you to Alicia King (Squad leader) and Ana-Maria Popp (Cat4 Capt.) for all their hard work in bring together this fast Women’s Squad. You will see these amazing athletes at races across the PNW – from Sequim to Seward Park! Please congratulate them for recruiting and developing a fantastic group of athletes that are committed to developing the sport for women. We couldn’t have found a group of happier and more talented ladies with incredible speed, attitudes and leadership. We're getting pretty psyched for the 2014 as our new kits have arrived. Look for them on Seattle roads soon! Thanks to everyone who came out for a fun and successful road race August 24 in Gig Harbor. LakeWashingtonVelo and HBSC were proud to host you and want to thank all racers and volunteers that made the day fast and safe! Click here for pictures on FaceBook and here for results. Tela Crane Wins National Track Sprint Title! Congratulations to Tela Crane of our sister team Broadmark Capital Track Team w sponsor JL Velo for becoming 2013 National Sprint Champion!! 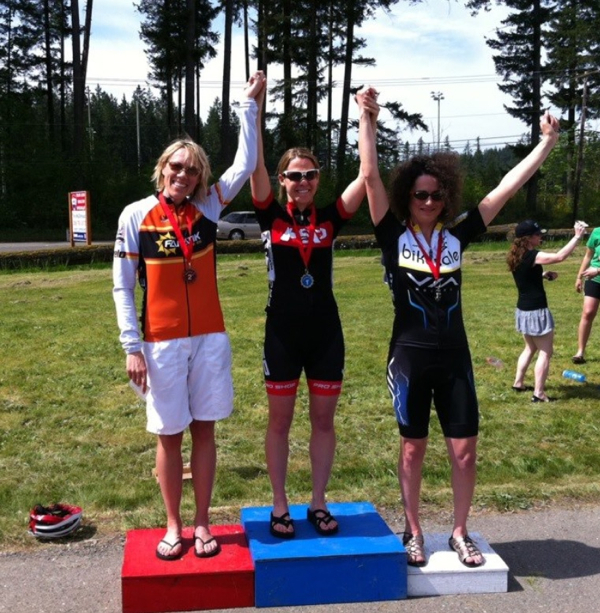 Seattle PI highlights women in racing and the new HBSC Women's team captained by Alicia King!! Contact us for information about joining this great effort in 2014! Seattle PI Velocity Blog on Women in Cycling!